South Beach, along Ocean Drive in Miami Florida, features many hotels and buildings in the Art Deco style. 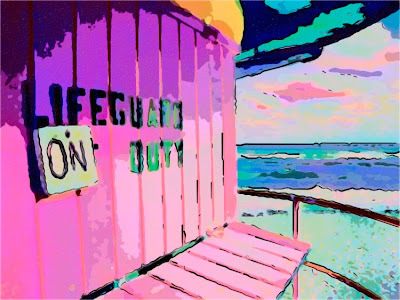 Aside from the awesome architecture, the lifeguard stands have a wonderful retro look about them too. With all the colors, sights and activity, South Beach is a photographer's wonderland! I was intrigued by the original photograph, but I wanted to expand on it a little and create an artistic look that you might find in a poster. I started by created a hyper-color version. I elaborated with the Stylize filter in Snap Art, one of my favorite Photoshop plug-ins!